Summary for the Busy Executive: An academic biography, illuminating odd corners of the 19th Century. Modest Musorgsky wrote comparatively little in his brief life, although at least five visionary masterpieces. He had both the advantages and disadvantages of the autodidact, including a raging ego and a defensive insecurity. 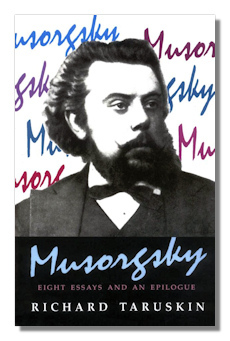 Yet for me, Modern music begins with Musorgsky, a musical mind so far ahead of his contemporaries that almost none – even among his most sympathetic friends – really understood what he was up to. In many ways, we still live with the consequences of their misapprehension. The pronouncements and "scholarship" of Soviet musicologists, many of whom (Pavel Lamm a remarkable exception) had to follow the dictates of Stalinist ideology, haven't helped. Then again, history was seldom just history in either Tsarist or Soviet Russia. It has a long record of catering to political pressures and advancing political factional goals. Taruskin's book wants to filter the babble from the received wisdom about the composer – appropriated as "representative" by reactionaries and radicals alike – and aims for a "true portrait" of the artist and his aims. Consider yourself warned, however. This isn't a book for the faint of heart. It bristles with musical examples, and Taruskin really packs his prose. Nevertheless, like his book on Stravinsky, this one tells you a lot about the music, both in and of itself and as part of cultural history. Taruskin creates a new image of the composer by a close examination of scores and letters. If nothing else, he establishes basic facts. He amply repays a reader's effort. Taruskin begins with a few explanatory notes on the conventions he followed on transliteration, old style and new style Russian dates, the pronunciation of the composer's name, and what exactly is a kuchka anyway? Musorgsky belonged for a number of years to a group of nationalist Russian composers known as moguchaya kuchka, the Mighty Handful, in the usual translation. But the term more closely approximates a social, "clubbable" group – a bunch, if you will, as in the phrase "the lunch bunch." Much of our traditional transliteration derives from French. Taruskin seems to work for a one-to-one (as much as possible) correspondence between the Cyrillic and Roman symbols: hence, "Musorgsky," rather than "Moussorgsky" or even (as I'm used to) "Mussorgsky." Musorgsky was born "Musorsky," minus the "g," and one accents the name on the first, rather than on the second syllable. Also my Favorite Fun Fact in the entire book comes from this section. MUsor means, roughly, "garbage." In slang, it can mean something equivalent to "boogers." "Snotsky" represents a perfectly valid Englishing of the name. Musorsky was quite aware of the derision his name could cause and, as his standing as a composer grew, added the now-familiar "g." In the Seventies, certain Soviet writers, following the incorrect Western pronunciation, shifted the accent to the second syllable to derive a false etymology with the word muSUgr (artist, musician). How Musorgsky handled folk elements, as exemplified by the early song "Little Star"
Finally, Taruskin considers the changes glasnost' brings to Musorgsky criticism, both for Russian and for international scholars. From this rich mix, a new Musorgsky emerges, practically steam-cleaned of Romantic and Soviet Schmutz. Hardly an artistic naïf, he was instead a conscious intellectual, given to analyzing (perhaps even over-analyzing) the direction of his art. Early on, he came to see the limitations of "musical realism" and moved toward conventional, even Italianate song structures, beginning with the second version of Boris. Indeed, that version came about not just because the opera house rejected the first version, but because Musorgsky genuinely thought the changes necessary. He went much farther in his revisions than the demands made by the opera directorate. The following fact emerges most strongly. Because Musorgsky began late and died young, almost all his scores fall under the heading of "early works." Khovanshchina and Sorochintsï Fair herald a significant change in style, and Musorgsky never lived to finish either. Taruskin doesn't paper over the less-than-savory aspects of the composer's personality, notably the anti-Semitism which he shared with every other member of the kuchka except for Rimsky-Korsakov. Not content with merely making and substantiating the charge, Taruskin also shows how anti-Semitism turns up in Musorgsky's music – resoundingly in Sorochintsï Fair, more ambiguously in Pictures at an Exhibition. Taruskin writes neither a full biography nor a comprehensive analytical study. He focuses on important and promising areas of exploration and mines them for all they're worth. The early essays go heavy on musical detail, the later ones on cultural history. It all takes a bit of stamina, but your persistence will reward you. Copyright © 2008 by Steve Schwartz.